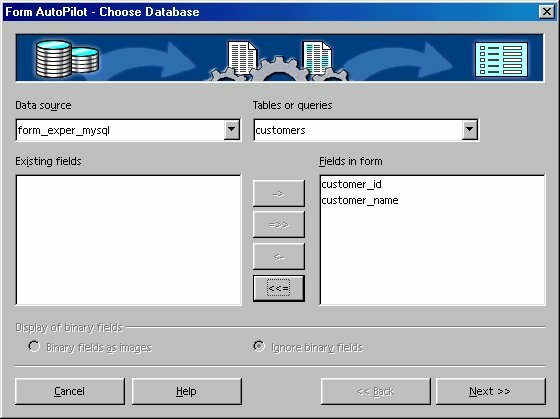 This document attempts to show how to set up a master form and linked detail form for a MySQL database, via ODBC. You might want to display an author and all the books written by that author, or an actor and all the films that actor has appeared in, or a customer and all the orders placed by that customer. Two database tables are linked together by means of an SQL query containing a named parameter (more later). The example you will construct uses customers in a customers table and orders for those customers in an orders table. Each order is linked to the customer who placed it by means of a cust_id value in the orders table that matches a customer_id value in the customers table. It is useful to keep in mind the distinction between the underlying MySQL database tables, which contain the actual data and which are managed by the MySQL server, and the OOo graphical widgets that display the data from the tables. 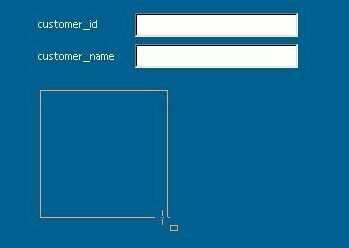 You will be using these widgets, such as Fields and Table Grids, to create a linked set of forms. 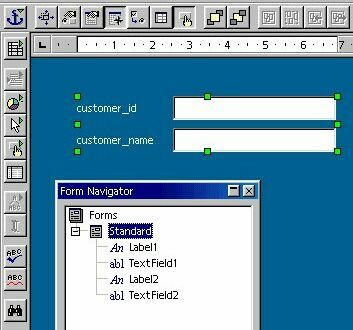 The goal will be to create a form with labeled fields to display the data for a single customer, and a subform containing a table grid that will show all the orders for that customer. When the two forms are linked together properly, you will be able to browse through the list of customers, one at a time, and have the table grid change each time to show orders for the current customer. 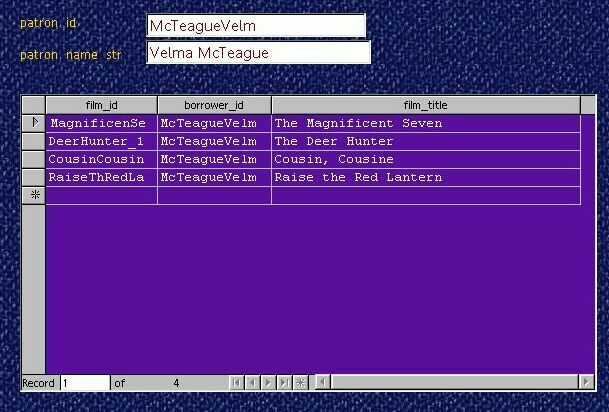 This example was constructed using a standalone, single-user installation of OOo 1.0.1 on Windows98. The process may generalize to multiuser installations and to other OSs, but it has not been tested. MySQL is available from http://www.mysql.com/. We will assume that you have installed MySQL, that you can create and populate MySQL databases, that you can set up an ODBC data source in OOo and make the data tables appear in OOo, and that you are able to add, delete, and modify records. 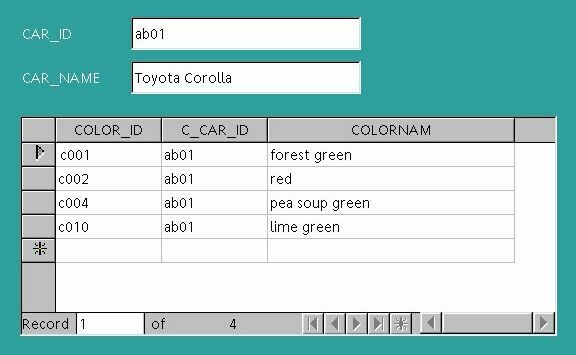 Remember that OOo can only edit database tables that have a primary key or unique indexed column. Other tables are read-only. There is a lot of information in that document; you may want to read it first. The process should be similar for PostgreSQL, Oracle, Firebird (Interbase), MS SQL Server, and other RDBMS's that can use ODBC. Note that dBase tables can be linked together, but results have been uneven. The process should also work if the connection is via JDBC. See How Can I connect to MySQL? Create the database. Here we are using MySQL v3.23.49 and myodbc v2.50.37. See 'How to Create a Data Source from Scratch' mentioned above. In this example, the datasource is called 'form_exper_mysql'. (F4 or View > Data Sources). To the right is the Beamer or data source viewer. Help > Contents > Index tab and type in the search words data sources. Look at the article data source; overview (or data sources explorer; overview ). To create a new table, click on the word Tables under your data source in the Data Source Explorer, right-click, and choose New Table Design. Or to modify the structure of an existing table, select the table name, right-click, and choose Edit Table. And see the How-to 'OpenOffice.org 1.0, unixODBC, and mySQL' mentioned above. But you would not be able to use the Table Design window to modify the size of an existing column. The settings for existing columns appear to be grayed-out. This seems to be a missing feature in the ODBC driver and may be added in future releases. 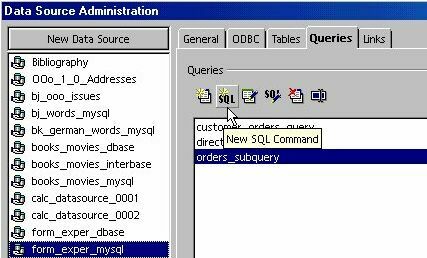 Select your data source, select the Queries tab, and click on the New SQL Command button. You will get a Query window (next figure) in which you can type an SQL command. Let's experiment on the films table. In the figure we have entered a command to change the size of the genre column in the films table from char(16) to char(22). 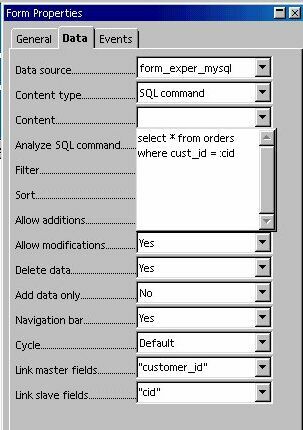 Press the Run SQL Command Directly button (fourth button from left) and then press the Run button (the leftmost button) to run the SQL command. and again press the Run button. You should now see a listing of the fields of the films table with the genre field having the new column size. Help > Contents > Index tab and type in the search word SQL. Look at the articles SQL: executing directly and SQL statements; executing. Now back to our customers and orders tables. If everything worked, you should be able to see the two table names in the Datasource Explorer and two empty grids with labeled columns in the Beamer. MySQL does not yet enforce referential integrity of foreign keys, so be sure that the cust_id values in the orders table match a customer_id value in the customers table. Just for illustration, we have added an order with order_id 3013 for a non-existent customer (cust_id = 3),. If referential integrity constraints were being enforced, insertion of this record would have been prohibited. The order is an orphan and would never show up in the linked detail table we are going to build, since it is not linked to any customer. Delete the extra order record. Referential integrity constraints, which should be added in a future version of MySQL, would also prevent us from deleting a customer record from the customers table as long as the orders table contains at least one order for that customer. And if we changed the value of a customer's customer_id in the customers table, referential integrity could also change the corresponding cust_id values in the orders table to match the new value. Many other Relational Database Management Systems (RDBMSs) do support and enforce referential integrity constraints. As of OOo 1.0.1, there is no user interface (dialog box) for turning on the recognition of named parameters. Until a user interface becomes available, you will have to use a macro to turn on recognition of named parameters for each datasource that needs to use them. However, this problem is being addressed; so the macro may not be needed in the future. The macro is part of the FAQ for the Database Access Project at http://dba.openoffice.org/FAQ/ (see question 3 in the FAQ). http://dba.openoffice.org/howto/param_subst.html It is included below, with permission. From the OOo main menu, choose Tools > Macro. under soffice > Standard, select Module1 and click Edit. This will open the BASIC IDE, where you can type in macro code. Copy all three parts of the macro code from the yellow section below and paste them into the IDE window. In the Main subroutine, change the name in quotes from “Bibliography” to the name of your datasource. This is the only editing you need to do to the macro, at least for this datasource. Click on the Run icon to run the macro. To repeat, the need for this macro is expected to disappear in the near future. 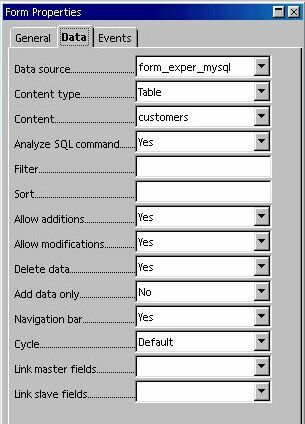 In the first dialog box, select your Data Source and then select the table for the main form (here it is the customers table). Click the =>> button to include all the fields (columns) in the form. In the second dialog box, click one of the five 'Arrangement of DB fields' buttons. Select a page background style from the list at right. Select an appropriate directory for the form; accept the suggested name or make up a different name. Save the form. You now have the first half of the form done. Click on the Form Navigator button (fifth from the left in the toolbar above the form). 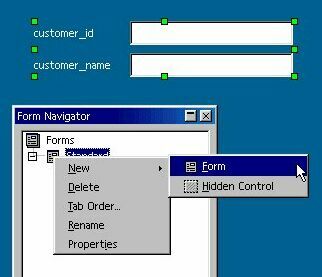 The Form Navigator window shows that you have one form, called Standard, containing two Labels and two TextFields. The area in the figure with green handles is the Standard form. The rest of the page is just a writer text document (.sxw). You now have a main or master form and a subform. We will link the subform to the main form in a few minutes, by means of an SQL query with a named parameter. Now you need to place a table grid control on the page to represent the subform. 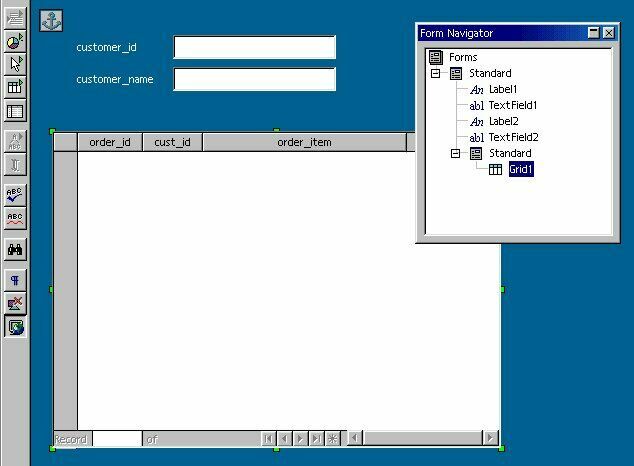 Check to be sure that the Standard subform is selected in the Form Navigator, so that the table grid will belong to the subform rather than to the main form. Click-and-hold (long-click) on the Form button in the toolbar at the left (a hand with a finger pointing). Click on the Table Control button. 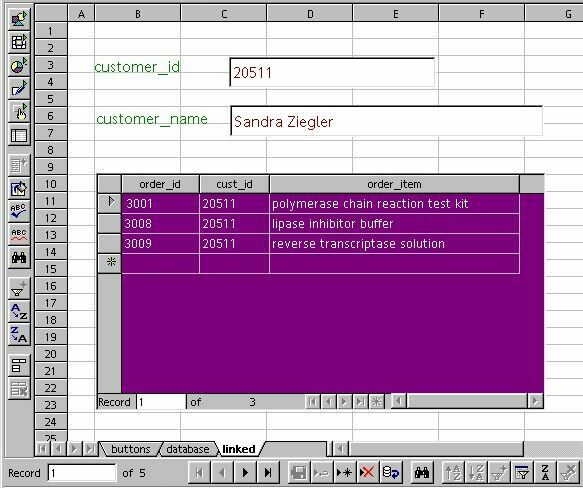 In the form, drag out a rectangular outline for the orders table grid. When you release the mouse button, a dialog box will appear. and select orders from the Table list. In the second dialog box, click the =>> button to add all the fields of the orders table to the grid. Normally you would not need to display the cust_id field in this grid, but it is included here for purposes of illustration. You can drag the right edge of the 'order_item' column header to make a wider column. 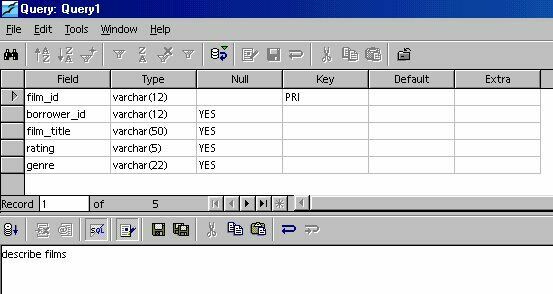 'Edit mode' might better be called 'form-design mode', to distinguish it from 'form alive' or 'form running' mode, where you can edit the data in the underlying tables. In 'form-design mode', no data are visible, but you can work on the structure and properties of the form. Close the Form Properties dialog. Make sure the Data Source is set to the name of your Data Source. Set Content type to 'SQL command'. The named parameter 'cid' can be any meaningful variable name, preceded by a ':' . The program will add the quotes. The variable cid will now stand for the value of the primary key in the current record of the customers table. 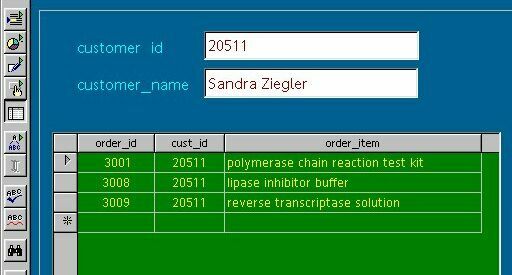 The SQL query will return those records from the orders table whose cust_id field matches the current value of cid. When you move to the next customer record, cid will take on a new value. 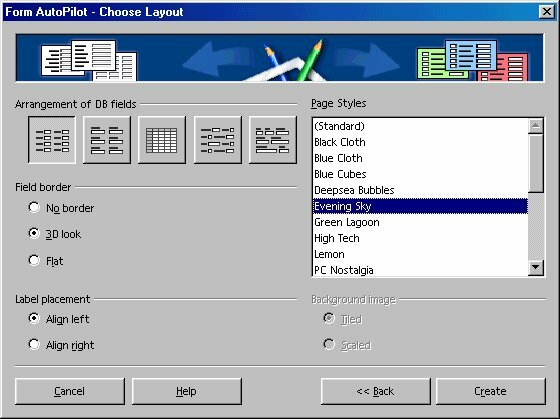 Set any other properties for the various Labels, TextFields, and Grid, such as font size, color, background color, etc. Your form should now show the first customer and all of that customer's orders. If, instead of the expected result, you get a cryptic error message like the following, it may be that recognition of named parameters was not done correctly. Go back and try running the macro again. You should be able to add new order records for the current customer, modify an existing order, or delete an order. Here we have added two additional orders for customer 20511 by just typing them in. 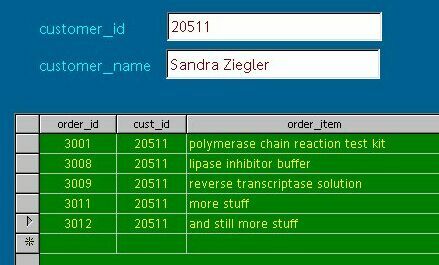 In fact, since we are looking at only this customer at the moment, the cust_id value of 20511 is filled in automatically when we click in the Insert New Record row, marked by an '*'. it may be because OOo creates Text Box Fields when it should create Numeric Fields for integers. Note that there is no property for the number of decimal places. We really should have a different kind of field here. 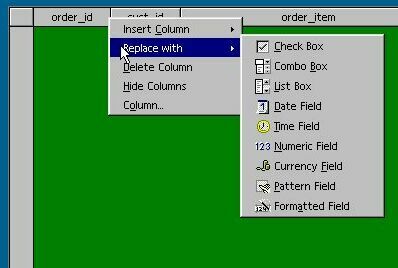 If you right-click again on the order_id column header, you will see that you can insert additional columns next to the order_id column, or you can replace the Text Box Field with a different kind of field. Either a Numeric Field or a Formatted Field would be a better choice for displaying integer data. You can also move a column to a new location by using Alt-drag. Just as an experiment, try inserting two extra columns. 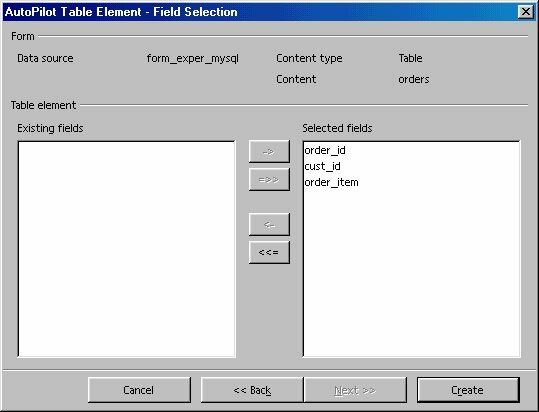 As in the following two figures, we will insert a Numeric Field and a Formatted Field. 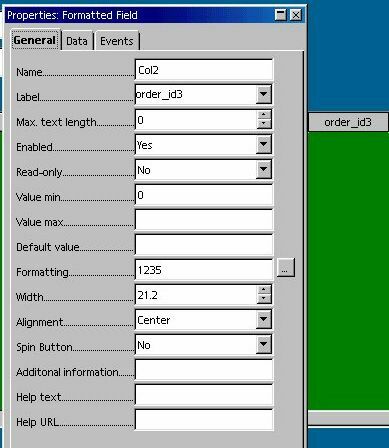 Click on the order_id column header, right-click, and choose Insert Column. Insert a Numeric Field, which may be labeled “Col1”. 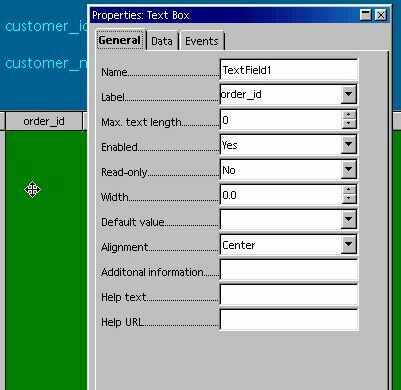 Click on it to select it, then right-click and choose Column... On the Data tab of the Properties dialog, attach the field to the underlying order_id field of the orders table by typing in “order_id”. On the General tab, set the Label property to “order_id2”. Set the Decimal accuracy to 0 (no decimal places). And since we are using unsigned integers, set Value min to 0 as well. You could also set Alignment to “Center”. On the Data tab of the Properties dialog box, attach the field to the order_id field by typing in “order_id”. On the General tab, set the Label property to “order_id3”. Click the Formatting button and choose the integer value from the list (no decimal places). You could also set Alignment to “Center”. Close the dialog box. Click the Form button to exit Edit mode. You should now see three different types of fields all displaying the same order_id data. When you have seen the results of the experiment, you can delete the two fields you just added. 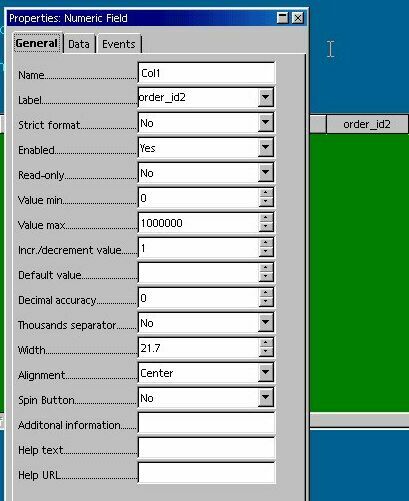 You might want to replace the Text Box Fields for the order_id and cust_id fields with Numeric Fields, if your integer values are not displaying correctly. and :cid refers to the primary key car_id in a cars table. Note that the Add New Record * is enabled; it is possible to edit the data in the subform. The c010 record was added by typing it into the subform. However, linking other dBase tables has been less successful. 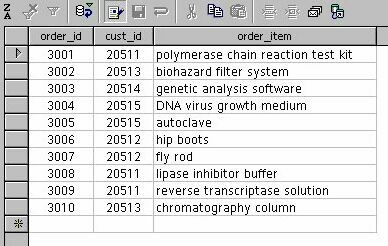 dBase tables produced in OOo have not worked as well as tables created in another database program and then exported. The main difference seems to be the ability to create a primary key. Here is a slightly more complex example with MySQL tables. We want to display the actors that appeared in a particular film. We have three tables: films, actors, and acted_in. 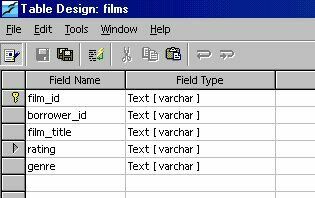 The acted_in table holds pairs of film_id / actor_id values plus a sequence number called billing and a character name for each part in the film. Most of the keys are alphanumeric. And the named parameter :fid is linked to the current value of film_id in the films table. As these tables get larger, you would need to index certain columns to speed up queries. For simplicity, we have omitted a directors table, a screenwriters table, and perhaps a separate table to hold still photos and video clips. And many actors. These examples were built on a writer document, using the AutoPilot. The same thing can be constructed on a spreadsheet, but you will have to put the pieces in place by hand. 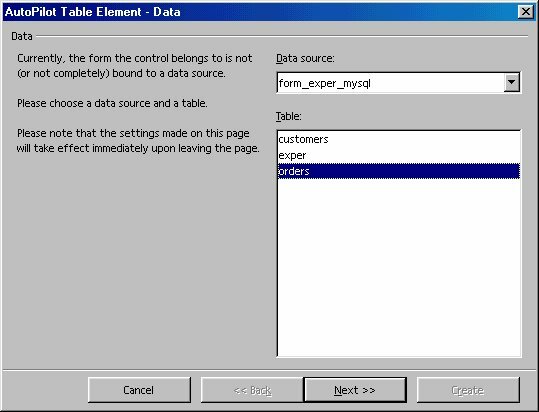 You have created a form to display individual records of a master table (the customers table) and a subform to display the linked order records for the current customer from a detail table (the orders table). You have used an SQL query containing a named parameter to link the subform to the main form. You have set the “Link master fields” property of the subform to the name of the primary key field in the customers table and the “Link slave fields” property to the named parameter. You can now browse through the customers and see the orders for each customer. For any one customer, you can add, modify, and delete orders. You can generalize this process to other sets of data tables. You also understand a bit more about working with OOo graphical widgets, including setting their various properties. This example has been a fairly basic one. Anything more complicated will have to wait for another How-to. The Original Documentation is "How to Link Tables Using SQL Named Parameters". The Initial Writer of the Original Documentation is Daniel Strome, Copyright © 2002. All Rights Reserved. (Initial Writer contact(s): mailto:danstrome@openoffice.org ).